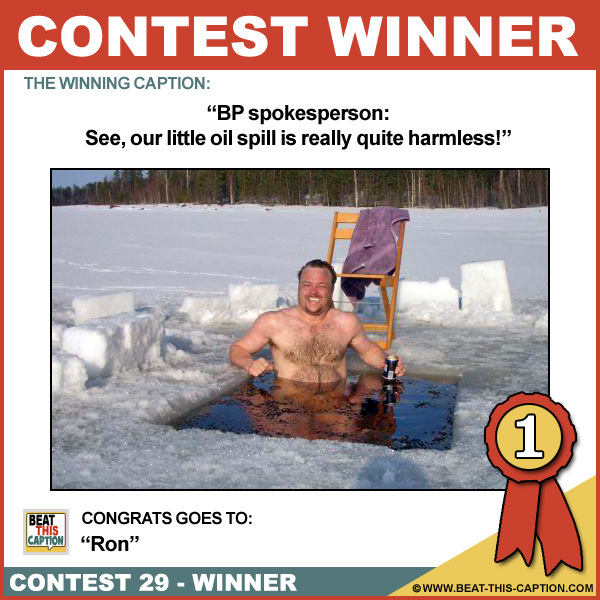 Beat This Caption Contest 29 Winner – Caption Contest Funny Clever Witty Enter Today! My big hairy worm catches all the fish! BP spokesperson: See, our little oil spill is really quite harmless! No, George, the bath’s over there – that’s our urinal! I’ll try anything to soothe these damn hemorrhoids! Oooohhh! I’m gettin nibbles on my kibbles! I figure, once my chest hair is frozen, it’ll be easier to wax! I’ll bet your wondering how my hole got so perfect? Whoa i think i gotta big one! The catch of the day…one baby shrimp and two scallops! What? The sperm aren’t frozen until AFTER the donation? A round peg in a square hole! No, it’s just shrinkage caused by the cold! Finally; a clear photo of Sasquatch! I sure picked the wrong day to manscape!